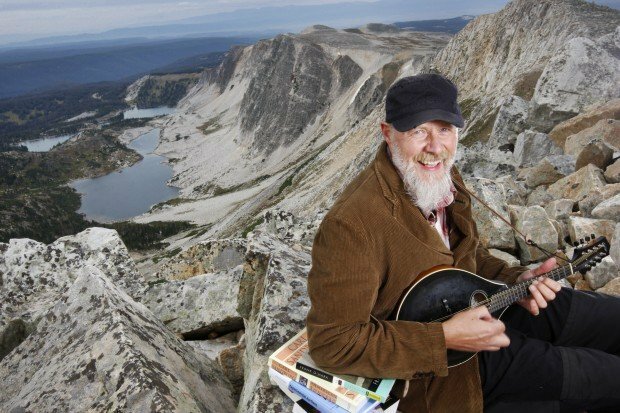 Jason Shogren plays his mandolin Sunday on top of Medicine Bow Peak near Centennial. 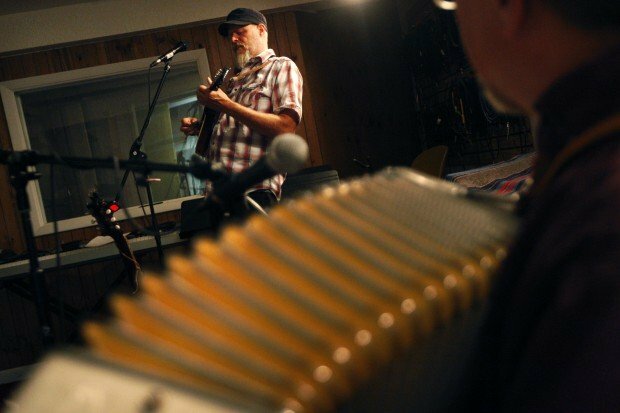 Jason Shogren, left, practices with members of his band, J. Shogren & the Shainghai'd, including Bill McKay, right, on Aug. 20 at Thunderground Sound Studios in Laramie. Shogren is a musician as well as an environmental economist and professor at the University of Wyoming. J Shogren and the Shanghai’d performs in an undated file photo. Jason Shogren plays mandolin on top of Medicine Bow Peak near Centennial. He and his band will perform at What Fest, which takes place July 25 - 26 in Riverside. Jason Shogren is a former adviser to President Clinton, birthday present to the King of Sweden and member of a Nobel Peace Prize winning team of scientists. But none of that seems important now. It is a Tuesday night at Thunderground Sound Studios in Laramie and Shogren is focused on perfecting a harmony. He and his band, J. Shogren and the Shainghai’d, have gathered here to run through their set list in preparations for the Snowy Range Music Festival this weekend. Shogren, 55, is standing before a microphone clutching a mandolin. He looks relaxed, wearing a black army cap, plaid shirt, dark jeans and Birkenstocks, no socks. The music starts: a pulsating bass, wailing accordion and plunking mandolin set to a frenetic drum beat. There is a quick break in the music and they “huh, huh, huh,” in unison. It’s as if David Grisman met The Dropkick Murphy’s. Shogren has become a staple of the Wyoming music scene in recent years. He is a common sight onstage at festivals like NoWoodstock, What Fest and Snowy Range. In 2012, the band won the Wyoming Blues Challenge, going on to represent the Cowboy State at the International Blue Challenge in Memphis. And earlier this year, Shogren and his band joined Jalan Crossland and Screen Door Porch on the three-state, 14-show WYOmericana tour. Shogren has an unorthodox background for a musician. He is an environmental economist. For more than two decades, he has taught at Appalachian State University and Iowa State University, Yale University and the University of Wyoming, where he has been a professor since 1995. His recent success onstage is made more surprising by the fact that he had all but given up music in the early 1980s. It is afternoon now. Band practice is several hours away. Shogren is seated in a plastic Adirondack chair in his backyard, the signs of fatherhood strewn about on the ground around him: A toy fire truck here, a rocking horse there. His young son is, for the moment, asleep inside. Working on environmental issues, then, seemed like the natural thing to do. And so when it came time to pick a major in college, he chose economics. Philosophy seemed too abstract, accounting too cut and dry. Thomas D. Crocker, professor emeritus of energy and environmental at UW, was Shogren’s adviser when he was a doctoral student at UW in the 1980s. Shogren’s work is notable because it spans his field, he said. Generally speaking, there are three types of environmental economists: Those who study the source of environmental problems, those who study their costs and those who study the solutions. Shogren has made contributions to each, Crocker said. In 1997, Shogren was named to the President’s Council of Economic Advisers. The appointment came as the Clinton administration was gearing up for the debate about the Kyoto Protocol, the international agreement aimed at curbing carbon emissions. Shogren was focused on the protocol’s implementation, its timeline, enforcement mechanisms and potential participants. A decade later he was named an advisor to the King of Sweden, Carl XVI Gustaf. The position was paid for by an endowment the King received for his 50th birthday. Each year Gustaf selects a scholar to advise him and, in 2007, he chose Shogren to counsel him on climate change and resource management. Shogren met his current wife, Linda Phunstrom, on the trip. The same year, the Intergovernmental Panel on Climate Change was awarded a Nobel Peace Prize for its research establishing a connection between human activity and global warming. Shogren was one of 2,000 scientists and researchers on the panel. He is understated to the extreme when it comes to talking about those accomplishments. “I just happened to be one of the worker bees,” is all he said about the Nobel. He was lead author of a chapter in the IPCC’s climate assessment analyzing the cost of inaction versus the cost of action. Jascha Herdt, who has played drums in the Shainghai’d for three and a half years, recalls Shogren talking about such achievements only once. They were on a car ride and Herdt asked his band mate about the most influential paper he’d penned. Shogren named a paper, explained it briefly and left it at that. Around a decade ago Shogren went through a familial crisis. He has two older children from a previous marriage and one of them was going through a difficult period. Shogren, consumed by his work at the time, felt like he missed the early warning signs that might have staved off a crisis. It prompted a period of reflection. There is a tendency in economics to view people as “econo-bots,” individuals motivated purely by economic rationale. But people often don’t act in economically rational ways. It’s a quandary the profession struggles to answer, Shogren said. He started reading poetry and Shakespeare in hopes they might provide some answers where economics did not. Then a funny thing happened. He started writing music again. He has since recorded four CDs and is working on a fifth. Back at Thunderground Sound, Shogren and his band mates are making a second go at their harmony. The first attempt was a bit clunky. The music starts again. The bass pulsates and the drum beat drives the song forward. The accordion and mandolin enter. They’re just a little tighter now, rising and falling with the rhythm set by the other instruments. The music ends. Shogren nods his head up and down, signaling his approval. Then they move onto the next song. The Snowy Range Music Festival, now in it's fifth year, has become one of the biggest in Wyoming. This year's lineup features LeAnn Rimes, Keller Williams, A.J. Croce and a host of others. Here are the details you need to know if you go. * Tickets: Friday $20 student/teen, $30 general admission; Saturday $30 student/teen, $45 general admission; Sunday $30 student/teen, $45 general admission. Three day pass $95. Three day pass and camping $130. * What: J. Shogren and the Shainghai'd open the Snowy Range Music Festival.